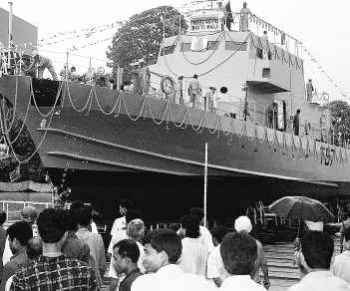 NEW DELHI: The Indian Navy on Tuesday launched its fast attack craft `Batti Malv’, the third in a series of four being built at Garden Reach, Kolkata. These craft will be commissioned in batches of two in November this year and February next. These are follow-on ships of Trinkat class built earlier at Garden Reach in 2000-02 and at present based at Port Blair. The fast attack craft (FAC) displace 260 tonnes, have an overall length of 46 metres and are designed to attain speeds of over 28 knots. With a large indigenous content, these craft are poised to give yet another boost to the Indian Navy’s drive towards indigenisation and self-reliance, said a Navy spokesperson. FACs are meant for interdiction duties in and around coastal waters and island territories. The ships also perform anti-poaching and anti-smuggling duties, besides providing protection to fisheries and sea installations. They are equipped with state of the art machinery and equipment along with the latest communication sets.